Bryant Park neighbor MetLife has secured the naming rights to The New Meadowlands Stadium, home of New York's own Jets and Giants football teams. 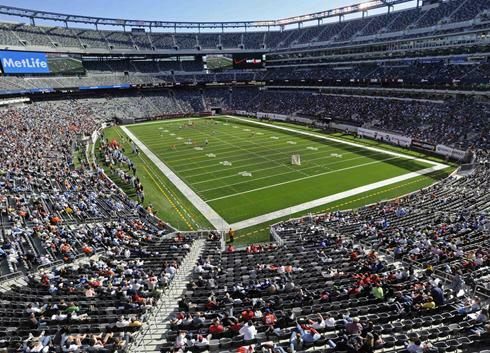 The first game in the newly appointed East Rutherford, New Jersey stadium will be this weekend, when the Jets take on the Giants at the annual preseason event. But before they play Saturday, a few stars from both teams will be in Bryant Park to celebrate MetLife's new home. Stop by the park for interaction with players and team swag. As of 3:01pm August 26th, the contest is closed. Thanks to all who entered. Winners will be emailed with information on how to claim their tickets. 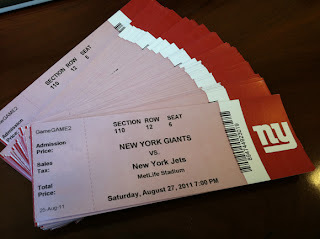 In honor of MetLife Stadium, the Bryant Park Blog is giving away tickets to tomorrow's Jets vs. Giants game at 2pm. You'll get an extra entry per item. We believe in the honor code! The contest will close at 3:00pm today (Friday, August 26) and winners will be announced later today around 3:30pm via email. A valid email address is required for entry. This is a quick one, so if you win, you'll have to pick up your tickets at our Midtown offices by 6pm today. J E T S Jets Jets Jets of course!!! Already following and a fan! already liking the facebook page. Giants will have a better record!! This is the Jets year. JETS! Most definitely the JETS! Last season Mark Sanchez lead us to the playoffs, the team as whole, in my opinion, is just inspired and ready to go ALL THE WAY this time! I can feel it, they can feel it, my dog can feel it. It's just going to happen and I'll be watching closely. I'd LOVE to go see them tomorrow! Giants fan, but Jets are the top dogs this year. I follow you both on fb and twitter. JETS all day! With plaxico, Holmes, Mason, and Sanchez working together, we are gonna be unstoppable!! Go jets!!!! The Giants are going to surprise people this year. I say the GIants. Jets are going to bring it home fasure! When you're a Jet, you're a Jet all the way from your first cigarette to your last dying day!!! I'm a Giants Fan but you gotta believe the J-E-T-S will have the better record this season baring injury. I love both my New York teams! But if it comes down to the very end, I'd go BIG BLUE! can't forget our GIANT win ;) !! With this season's new players and the steam left over from last season's good record, there is no doubt the Jets be the reigning NY team. It also doesn't hurt that I am an epic fan! NY Football Giants will have the better record this year - FOR SURE!!!! Jet's have to play a tougher schedule due to making the playoffs last year. Gooooo Big Blue!!! Isn't blue a MetLife core color?? ; ). i am sorry to say this, but the JETS will definitely have a better record than the Giants this season.... Looking forward to seeing Plexico out there in GREEN! BIG BLUE ALL DAY EVERY DAY!!! GMEN ALL THE WAY! We should've been in the playoffs last year!